Throughout most of history, all over the world, women's attire has of necessity been designed to adapt to the needs of pregnancy and breast-feeding, which were likely to take up a large percentage of women's lives between puberty and menopause. Before the industrial revolution, the making of fabric and clothing was labor-intensive enough to preclude the making of garments exclusive to pregnancy. Thus, in Western Europe since medieval times, regular dress of all classes has been easily adapted for pregnancy. Laced bodices, frequently involving center panels to cover expanding waistlines, were prevalent. Petticoats, separate or integral with bodices, were tied at both sides, equally adaptable. Women appeared not to mind the rising hemline in front that resulted from the use of a normal wardrobe during pregnancy. 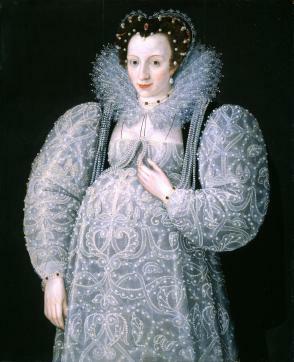 Beginning in the sixteenth century, styles became more restrictive. Bodices were reinforced with boning, but they were still most often laced. Writers scolded women for wearing these styles during pregnancy, accusing them of putting vanity above the health of their unborn child. But it is possible to rest the bodice or corset on the pregnant belly without constricting it, and this was probably common. Women did not abandon corsets during pregnancy, at least in public. Women of all classes wore corsets during pregnancy, tilted across their stomachs, aprons worn high to conceal the gap at the bodice's front. Some women did contrive garments specifically for pregnancy, as a surviving set of eighteenth-century quilted garments in the collection at Colonial Williamsburg attests, in which a waistcoat expands over the belly to cover the gap in the jacket front. Possibly this sort of individualized contrivance occurred more often, at least among members of the upper class who could afford it, than surviving examples can document. Privately, fashionable women in the seventeenth and eighteenth centuries could wear loose "wrapping gowns," popular at-home wear, worn by both sexes. Women of all classes also donned unboned sleeveless bodices, quilted or corded to support the belly and breasts. Working-class women had the added choice of loose, unconstructed jackets called "bed gowns" over a petticoat. The sack or sacque gown, introduced in the early eighteenth century, can apparently be credited to the marquise de Montespan, mistress of Louis XIV, who strove to conceal her pregnancy to remain longer at court. This was reported at the time and may be credited more than most such anecdotes deserve. Falling loose both front and back, the sacque later became fitted in front, and thus no more suited to pregnancy than other styles. At the turn of the nineteenth century, high-waisted styles were well suited both to pregnancy and breast-feeding. Not until waists returned to their normal level in the 1830s did pregnancy require more careful wardrobe planning. By 1830, most dresses hooked in back; center front openings, and a "drop-front" skirt, were still occasionally used, suggesting wear during pregnancy. In the 1840s and 1850s, the "fan pleated" bodice was popular, partly because it was easily adapted. In surviving examples, gathers beginning at the shoulders extend to the waist and are gathered on drawstrings, allowing expansion and access for breast-feeding and gradual tightening as the body returned to pre-partum shape. Other innovations also existed, such as expansion of the gathers found in the era's ample skirts. Some nineteenth-century maternity garments contain linings intended to lace over the belly, providing support without constricting it, since the period's more curvilinear corsets were likelier to cause harm than earlier styles. Less constrictive corsets-less boned, or with expandable lacings over the belly-were also available. Victorian women did not, as popular myth says, stay at home during pregnancy. Fashion magazines, with typical reticence, fail to identify maternity styles, but they can be detected by careful reading: pregnancy corsets are called "abdominal corsets," and phrases such as "for the young matron," "for the recently married lady," reveal maternity styles. An alert modern reader can easily find them, although pregnant figures are not depicted. The 1860s brought the use of separates to aid pregnant women. For the rest of the nineteenth century, both at-home and fashionable dress offered styles that worked during pregnancy. Boxy jackets and amply gathered center bodice panels, for example, seen in the 1880s and 1890s, are among the obvious styles to choose. In the twentieth century, the ready-to-wear industry strove to cater more to women by adapting current fashions to pregnancy. When catalogs finally identify maternity fashions (about 1910), they still refrain from depicting the pregnant form, revealing old discomfort with the issue but suggesting that the styles were the same as others of the time, albeit with specialized construction. Often this meant a series of fasteners at the sides, so that the dress need not be any larger than necessary in the earlier stages of pregnancy. After World War II, specific maternity styles developed more markedly. Designers made pencil-thin skirts with elastic panels to cover a pregnant belly. Still, the tops often were made unnecessarily full, unlike regular fashions. Typical of postwar maternity fashion were oversized collars and buttons, an infantalizing effect possibly meant to balance the scale of the garment, although one may see in them a condescending attitude to women. Lucille Ball, star of I Love Lucy, exemplified the maternity fashions of the early 1950s, and at the time influenced many women during her 1952-1953 televised pregnancy, seen weekly by millions. In the early 1980s, Diana Princess Of Wales' two pregnancies influenced maternity styles. Dropped-waist dresses, then in fashion, were well suited to pregnancy and a favorite of Diana's. Dresses dropping straight from the yoke with no waist at all, one of the styles favored in the 1950s and 1960s, were also worn. Long tunics and sweaters over stretchy leggings became a popular casual choice. In the 1980s, styles for working pregnant women also emerged as a category of fashion, as garment makers, and would-be mothers, struggled to find styles apt for women in the workplace. Styles based on men's business suits still dominated, suggesting unease with the notion of women in business; pregnancy required even more cover-up. Maternity versions of masculine business suits resulted, with boxier jackets and expanded skirts. Since then, both office wear and maternity wear have developed away from closely copying men's business wear. The 1990s saw an end to the customary attempt to conceal pregnancy. 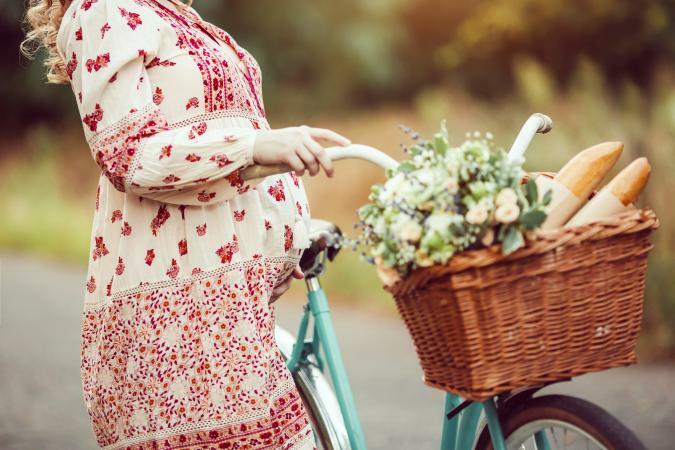 The emphasis on fit, athletic bodies, and the culture's comfort with revealing the human form, have led to adopting clinging maternity styles in place of centuries of draping and concealment, and even bare-midriff shirts are worn by pregnant women. Feminism and a body-conscious culture have taken maternity fashion in new directions. Baumgarten, Linda. "Dressing for Pregnancy: A Maternity Gown of 1780-1795." Dress: The Journal of the Costume Society of America 23 (1996). Hoffert, Sylvia D. Private Matters: American Attitudes Toward Childbearing and Infant Nurture in the Urban North, 1800-1860 (Women in American History). Urbana: University of Illinois Press, 1989. Leavitt, Judith Walzer. Brought to Bed: Childbearing in America 1750-1950. Oxford and London: Oxford University Press, 1986. Poli, Doretta Davanzo. Maternity Fashion. Drama Publishers, 1997.